Posted Thursday, July 1st, 2010 by Steve Leigh. 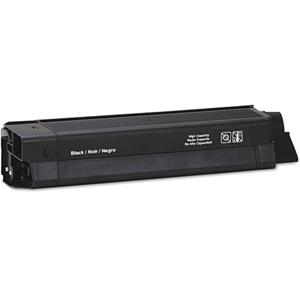 Many printers use a separate drum and toner cartridge so that each can be easily replaced independently. Other printers use a toner cartridge that includes the drum, so that both are replaced at once. 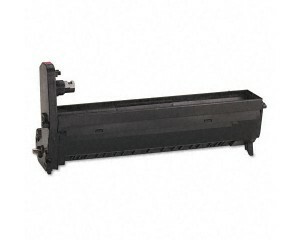 Okidata printers are unique in that they use a separate toner cartridge and drum, but they snap together into a single unit. Though there are slight differences in cartridges and drums between various OKI laser printer models, the concept is the same. Sometimes new Okidata customers who have recently purchased their first Okidata laser printer do not realize that the imaging drum and cartridge are two separate pieces locked together. Thus, when they order a replacement cartridge, the size of it can be awfully confusing as it is considerably smaller than the full assembly. This is an Okidata drum without a cartridge. This is an Okidata cartridge that is not yet attached to a drum. As you can see, the drum is like a cradle that the Okidata toner cartridge snaps into. After you snap it into place, there is a blue lever that will lock the cartridge in. Once the two parts are connected, the assembly can be installed into the machine. When it comes times to replace the cartridge, it is as simple as opening the top panel and turning that same lever to unlock the cartridge. You can remove it and install the new one without having to remove the drum. To replace the drum, though, the entire assembly must come out. Unlock and remove the cartridge and simply snap it in to the new drum, then reinstall. The process of replacing Okidata drums and cartridges can be confusing for first-timers or for people who have been using laser printers made by other manufacturers. Once you understand the system, however, it is quite simple. « What is MICR Toner?